Every opportunity that gives you an opportunity to connect with someone you should take it. If as leaders we are inaccessible or set ourselves up that make us unrelatable then we greatly diminish our ability to be effective in other’s lives. This doesn’t mean I will be everyone’s friend, but I certainly shouldn’t attempt to make myself unlikable. There are those who would say, “I don’t need to be liked but respected.” Reality – people won’t respect you if they don’t like you. People won’t follow you if they don’t like you. People won’t stay at your school if they don’t like you. Let us not confuse fear with respect. If I stake my leadership based on what others are doing or not doing, results driven rather than relationships, it communicates a culture that values performance over people. In that type of system, people will never be able to perform enough. Bottom line: Am I giving a compelling reason for people to stay connected and committed to our mission, school, district? If all you do is the minimum to satisfy your job description that minimum is exactly is what you will get. Consider ways to add value to your school or organization. 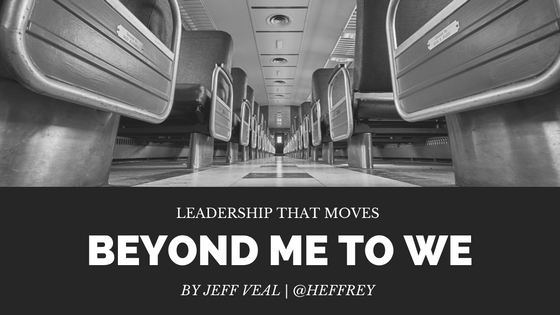 Lately, we have been in a series with #Leadupchat about moving from me to we, what is your critical contribution that adds value to the “We?” Take responsibility for the critical area in your position or on your team and lead with excellence. Make it a point to get better every day at what you do, guess what? You will. Why? Because it becomes a focused area of relentless pursuit. Bottom line: How does what I do contribute to what we do as a school? Does this move the dial? Building capacity in others doesn’t mean giving your people more tasks or work. Just like students can smell out an extension activity that is nothing more than busy work to keep them busy, we must be careful not to do that with our current or emerging leaders. Leaders understand that momentum will be maximized when one delegates authority, give decision-making permission to those around us. Let us not confuse tasks with authority. To truly build capacity are you allowing others around you to actually make decisions. A team can never win on the shoulders of the coach, decisions and implementing those ideas have to be made on the field or court. Our ability to build capacity fundamentally starts with believing the best about others and trusting them to do their jobs. Trust your people, allow them to make big decisions with you. As a leader, you should be able to focus on fewer decisions because you are empowering others to make decisions. If you feel exhausted having to make all the decisions it may be time to reevaluate your effectiveness in building capacity in others. Bottom Line: Do I delegate tasks or do I delegate authority? Don’t wait to become a great leader tomorrow, start today. As Simon Sinek says, we should be the leaders we wish we had.” Commit to be a leader with high standards, who believes that your greatness is defined less by your name but through others. Why? We need you now more than ever!